Be it interesting coffee mugs, calendars, moving greeting cards, decorative mouse pads, colourful bags, giftwrapping paper or complicated puzzles—how often do we not admire or even buy goods in shops with beautiful painted motives on and we do not even realise that it could well have been painted by the disabled? This was highlighted at the 2016 Decorex exhibition in Cape Town, where disabled painters from across the country showcased their talents (creating works of art with their mouths or feet) at the interactive stand of the Association of Mouth & Foot Painters (AMFP) and literally stole the show, leaving audiences speechless. Yvonne Labuschagne, MD of the Association of Mouth & Foot Painters in South Africa, says for more than 55 years the Association of Mouth and Foot Painting Artists (AMFP) have supported artists who, due to handicap or illness, have created works of art with their mouths or feet. Most of these artists join the AMFP with no or very little skill, but with the drive and determination to actively become self-sustainable and effectively contribute to the economy. 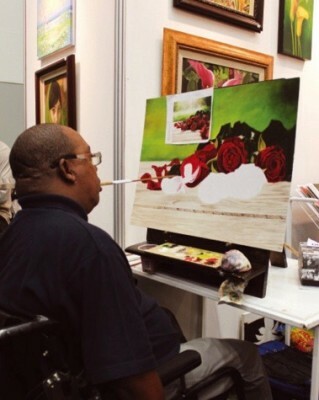 Because of their handicap these artists have a harder time selling their work than mainstream artists. The association helps them to distribute their artwork and gives them a base to work with without anxiety. It allows them to determine the life they wish to lead by letting them support themselves. Labuschagne is adamant that the artwork created by AMFP members is by no means a front for handouts, as the association excepts only ‘members’ with high artistic standards. “The personal abilities of each individual artist remains in the foreground, not his or her handicap. In this way, and only in this way, can they find a place for themselves within the international art market,” she says. The association acquires the reproduction rights of a given artwork and distributes it internationally through their partner publishers in the form of different products. The original works are sold at exhibitions held throughout the world. The AMFPA represents 800 mouth and foot painting artists in 74 countries around the world. They receive grants or are taken on as members and receive a regular income for their artistic proficiency. 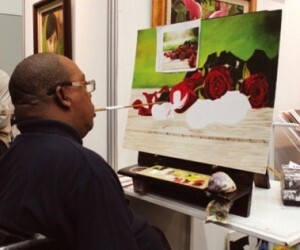 According to Labuschagne many of the disabled people who have managed to acquire these skills, are today more integrated into society than before they learnt to paint and are in their own right contributing to the economy. But how does the AMFPA concept work? Labuschagne explains that the artists mainly benefit from the financial objectives of the association. Student members receive a scholarship which will help them improve their standard of painting by providing funds for materials and tuition etc. This provides them with the means to become an associate or full member of the association. “As a student improves, the scholarship is increased. When a student has reached a standard judged to be the equivalent to that of non-disabled professionals, associate or full membership is granted. This means that the member will receive a monthly income for life regardless of whether increasing disability makes it impossible for him or her to continue providing paintings that the association can market. This removes the greatest anxiety to haunt the handicapped artist—the fear of losing one’s ability to paint through deteriorating health as the cost of independence for the disabled is high. “Membership enables the artist to concentrate on painting, secure in the knowledge that business matters are being handled according to their wishes by experienced able-bodied professionals, freeing them from financial anxiety. The association offers members and students the opportunity to gather, correspond and learn from each other. Members and students are able to meet at the many conferences, exhibitions and other events, and firm friendships often result,” she says. One such member is Patrick Botto, who in November 1993 was involved in a car accident and broke his neck between the fourth and fifth vertebra. It left him paralysed from the neck down. “In 1998 I started to learn to paint with my mouth and started art classes at the Bellville library for five years. My first painting took me four months to complete, but I endured. In 2000 I was accepted as a student at the Mouth and Foot Painters Association of Switzerland and in March 2015 I was promoted to associate member. I started painting with acrylics and moved over to water mixable-oil. I like to paint landscapes, flowers, animals and still life. “My motto in life is: My successes or victories depend on how I handle my failures and defeats. My spiritual motto is: I can do all things through Christ Jesus who strengthens me,” says Botto. Showcasing his amazing talent at Decorex 2016, was Martin Sodoms, who on Boxing Day in 1996, during a visit to his family, broke his neck in a diving accident, leaving his spinal cord permanently injured. Nine months after his rehabilitation treatment he was introduced to mouth-painting by Martie Westraadt, a local artist. Brenton Swartz has been a quadriplegic for fourteen years. A shooting accident left him paralysed from the neck down and he was classified as a C4-C5 quadriplegic. "I went to College in 1999 where I studied Computer Aided Draughting and obtained two certificates. I studied architecture from January 2003 and obtained my National Diploma as an Architectural Technician in December 2006. "I started painting full time in 2008 and was accepted as a student at the FMPA in September 2009 and my contract was renewed in March of 2012. My main goal in life is to live independently and to live a normal, happy life." The 44-year old Mpho Dithipe from Klerksdorp was paralysed from the neck down in 2001 after a shooting accident. Some of the mouth-and foot painters he met taught him to paint with his mouth. In 2006 the association granted him a bursary. Labuschagne says the AMFPA is not a charity organisation. “Marketing of products are done by the administrative office in George in the Western Cape only. No fund raising actions or door-to-door sales on behalf of the mouth and foot painters are ever undertaken. Finances of the association are derived solely from the sales of products. Salaries to members and scholarships to students are paid out from this income, as well as necessary administrative costs like salaries, manufacturing, mailing, taxes and rental,” she concludes.